“It seems almost inevitable that global growth will now follow China and go negative”. Why then, one wonders, did Apple’s share price rally by 17%, from $94 to $110, between 12 February and 1 April against this background? Apple’s shares have, of course, since collapsed back to $93 last night. Clearly nobody really cared about the fundamentals of supply/demand. Instead, just as in China with its commodities rally over the same period, prices were pushed higher by another sudden surge in liquidity. Chinese companies such as Shenzhen Zuoer Technology are now selling standard parts that enable a smartphone to be built for as little as $20. These phones use the free Android operating system, and offer touch-screen technology that doesn’t need complicated and expensive physical keyboards. The pace of change is also increasing. Samsung has its back against the wall, with its profits falling as it seeks to protect its market share. HTC actually lost money, and Microsoft has written down 80% of the value of Nokia’s business – which used to be the global market leader. The issue for Apple’s iPhone business is that the view from the top of the mountain is always the best. Apple’s iPhone day next month will no doubt boost sales as the iPhone 6S is launched. 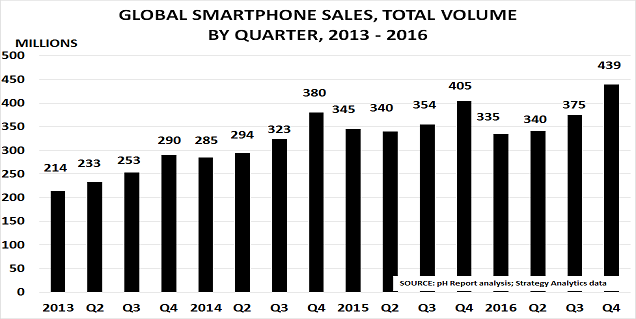 But analysts Morgan Stanley suggest iPhone sales will grow just 3% in 2016, well down on last quarter’s 35% growth. As I noted in May, Apple knows that the iPhone represents the past. Instead, its future success depends on using iPhone revenue to make the transition to selling application-based products, based on collecting health and fitness data and connecting to smart home devices. 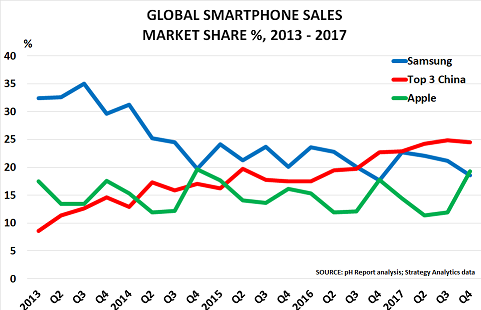 The smartphone market has been one of the ‘jewels in the crown” of the consumer electronics market. Yet today, it is rushing headlong into the world of the New Normal. We can all learn a lot about the outlook for the global economy from watching its development. But then in 2014, things began to change quite dramatically. Samsung suddenly found its middle market position being squeezed from both ends. 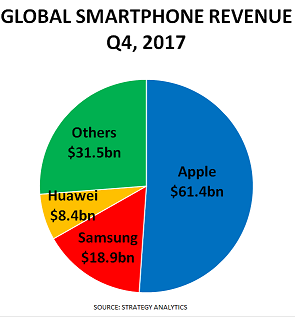 From the top end it was hit by Apple, who finally entered the Chinese market in a major way and pushed its global market share to 20%. 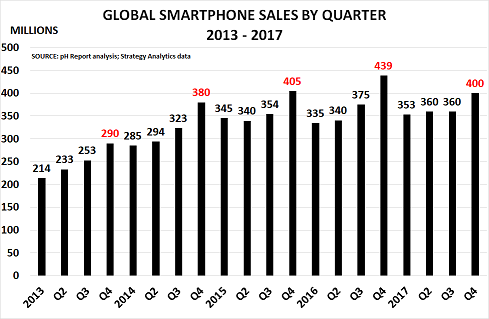 And it was hit from the bottom end by companies such as Xiaomi, Lenovo and Huawei selling very similar phones at much lower prices. Suddenly, Samsung’s value proposition of having a larger screen than Apple, combined with ‘affordable luxury’ pricing, didn’t work so well. Major internal debate is now underway over future strategy. And it seems unlikely the current concept of offering different models for every minor segment, supported by a vast advertising budget, can continue. In turn, the Korean, Taiwanese and Japanese companies who supply it with components are facing harder times. Sharp of Japan, for example, last week announced a $1.9bn loss and plans to sack one-tenth of its workforce. Korean companies have suffered too, with touchscreen panel manufacturer Iljin Dispay seeing profits fall 62%. One might have thought that low-end Chinese companies would still be doing well. But they are being hit by the slowdown in their home market, where sales fell by 6% in Q1. In turn, this is forcing a major shift in their strategy. Lenovo seems to be playing the role of industry consolidator, with the acquisition of Motorola its latest move. But its profits rose just 1% last year, despite a 20% increase in revenue, causing it to cut costs further by moving more sales online – mirroring Xiaomi’s successful strategy. In turn, Xiaomi is targeting growth outside China, launching a $205 phone for the Indian market and building sales across SEA. In an interesting move, it is also going up-market to compete with Apple with the $483 Mi Note model. It also aims to offer smart wristbands as well as air purifiers via a new online US store later this year. “We’ve continued to revise our pricing strategy, which is now closest to our production cost“. “Korea faces a similar predicament to Japan in the early 1990s, due in large part to the catch-up of latecomers like China“. Apple, of course, is still riding high today. But clearly it is only a mater of time before its highly profitable niche marketing strategy comes under full-frontal attack from Korea and China. Its future lies in making a successful shift to applications and services, as I noted when reviewing 2014 results in March. It is not the hardware of the Apple Watch that will secure Apple’s future, or even its sleek design. Instead, it is aiming to use this and similar products as a pathway to a wholly new business model. It has to hope it can create profitable new application-based markets, based on collecting health and fitness data and connecting to smart home devices. 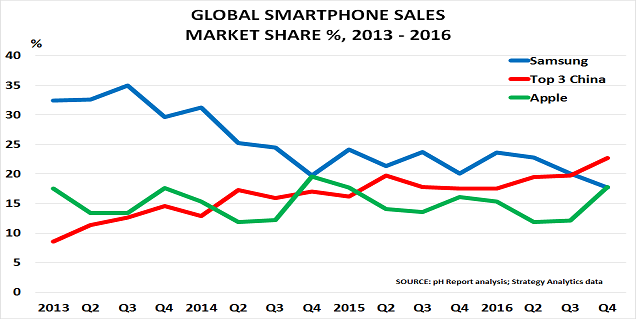 And, of course, the smartphone market is not alone is facing this New Normal challenge. They are coming to the online and High Street stores near all of us, if they haven’t already arrived.